Looking for a new dish for dinner? How about combining two favorites into a mouthwatering meal? I’m talking about Chicken Parmesan-Style Meatloaf. It’s the best of both worlds! For this recipe you can use homemade marinara sauce or your favorite store-bought variety. (My grocery store favorite continues to be Rao’s Tomato Basil Marinara Sauce) A little bit of that sauce gets mixed into the meatloaf mixture and the rest goes on top with slices of mozzarella! One of the secrets to making the meatloaf mixture moist is adding a little bit of chicken broth. The other tip is sautéing the onions and garlic, which gives the mixture even more moisture and a touch of natural sweetness. Mix it up, bake it up and devour! Chicken Parmesan-Style Meatloaf, from two dishes you love! 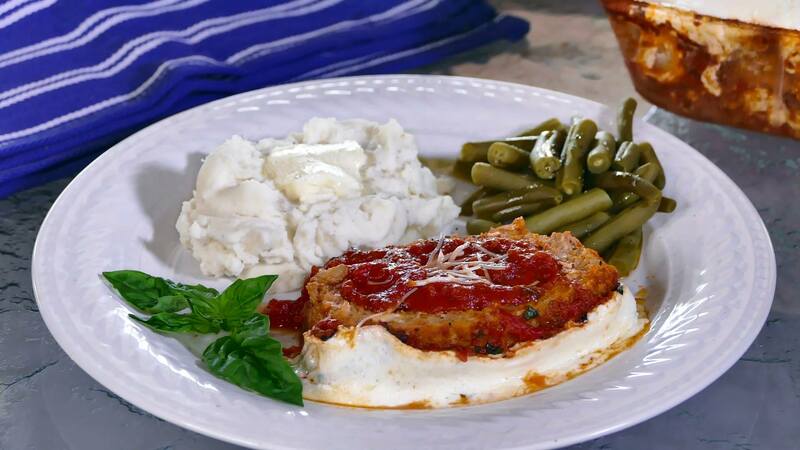 Watch my How To Video for Chicken Parmesan-Style Meatloaf here! Preheat oven to 375 degrees. In a skillet, sauté onion and garlic in olive oil over medium high heat until soft and translucent. Set aside to cool. In a large bowl, combine chicken or turkey and pork, eggs, breadcrumbs, mozzarella and Parmesan cheese, red pepper flakes, salt, pepper, ¼ cup marinara sauce, ¼ cup chicken broth and one tablespoon chopped basil. Mix gently until fully combined. Spoon about a ¼ inch of marinara sauce on bottom of a bread sized casserole dish. Fill casserole dish with meatloaf mixture. Pat gently on top to level. Cook at 375 degrees for one hour. Remove from oven. Spoon the remaining marinara sauce over top of the meatloaf. Sprinkle with 1 tablespoon of fresh basil. Layer slices of mozzarella over top of basil. Return to oven for 20 minutes or until cheese has melted. Allow chicken Parmesan meatloaf to cool for 5 minutes before slicing.